The fast growing electric car maker Tesla Motors to build its giga-scale battery factory in State of Nevada, US. Tesla is building this factory in partnership with Panasonic, supplier of lithium batteries for its present Tesla S model electric cars. 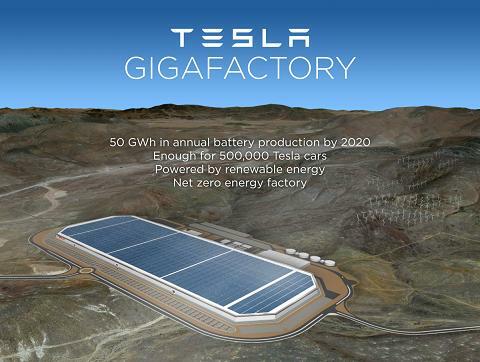 The massive battery factory to produce batteries with the production volume of 50 GWh per year. The interesting part of this factory is, this advanced factory use solar and wind energy with the net zero energy consumption from the nonrenewable energy sources. This answer to the question rised by electric car critics who are complaining on the CO2 producing fuel consumption in the production of battery. The complete factory is fitted with rooftop solar panels. See the picture below. “The Gigafactory is an important step in advancing the cause of sustainable transportation and will enable the mass production of compelling electric vehicles for decades to come. Together with Panasonic and other partners, we look forward to realizing the full potential of this project,” said Elon Musk, Chairman and CEO of Tesla Motors.